What is Notes.ini File in Lotus Notes? 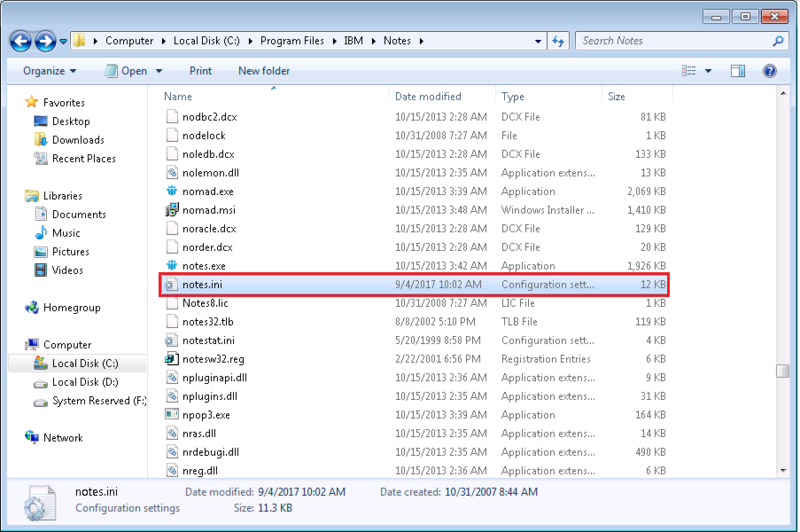 Notes.ini file is IBM Lotus Notes is basically a configuration file which consists of bulk client configuration in it. One can open this file in text editor and edit the file. Domino servers can work properly if correct settings can be made in the file. But if the settings are done in a wrong way then it can lead to unpredictable behavior of the Notes client as well as Domino servers. Where is Notes.ini File Located? First of all, open Windows Explorer. Then press on Alt button. A menu bar appears on which click on Tools >> Folder Options. 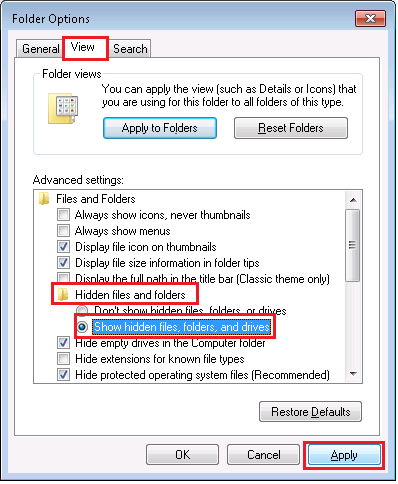 Click on the View tab and click on “Show hidden files, folders, and drives” radio button under “Hidden files and folders”. Go to Finder and click on Go >> Applications >> Utilities >> Terminal. Now, type the following command and press Return button. Now, enter the administrator password and press Return button. Then, you need to close Terminal to affect the settings. Click on Terminal from the menu bar and then hit on Quit Terminal. Locate the Lotus Notes preference file by clicking on Go from the Finder menu and then click on Home >> Library >> Preferences. Now you can open that file and use it accordingly. How to Edit Notes.ini File? Open Notes.ini file via Notepad or Notepad++ and edit it. This process totally depends on the client's or server's OS and the text editor used by the user. You can also create a configuration settings document and edit the settings. With the help of this document, you can easily modify more than one Notes.ini file at a time.This document works only for Domino servers and not for Notes client. Open Domino directory from Domino administrator and click on the Configuration from the Navigation pane. If you want to edit the existing Configuration settings then you need to highlight it and then click Edit Configuration. But if you need to create a new configuration document, then highlight the server on which Configuration settings must be applied and then click on Add Configuration. Click on Notes.ini Settings tab to make the settings in the file. A list of current settings will be visible in server's Notes.ini file. Click on Set/Modify Parameters to see all the settings you can set in the document. You need to select the settings to add from the list. Now, type of the variable from the Value field. You can also clear or modify the setting by highlighting Notes.ini variable in the list and then click on Clear. Now, choose Clear Parameter or Clear Value from the Clear Parameter or Value field. Clear the value before clearing the parameter. But is somehow, you want to clear a value then you can type in a new value. At last, save and close the document. The Current Parameters field shows that Notes.ini file have been configured for the Domino server. You can see the information that has been configured including the name of the setting, time and date of the settings, the value set with the name of the person who configured it. In the following blog, we have discussed the important role of Notes.ini configuration document file in IBM Notes email application. It is basically a configuration file but a minor setting can improve the efficiency of the entire client. 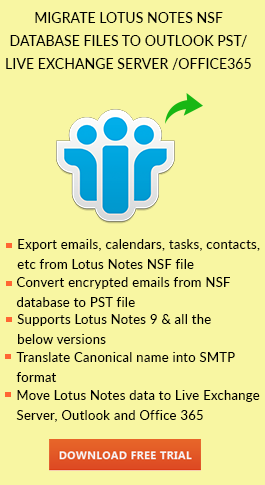 So, if you are looking for the solution to find and modify Notes.ini file in Lotus Notes, then you must go through the following article. If you want to migrate from Lotus Notes to Outlook then download software for free.